Are you sick of all my fall decorations yet? If so, lucky you since this is my last fall decor before I start working on Halloween! I know, it’s barely September. But if I want to get them all up for you to see before Halloween is here, I gotta get started 🙂 So before I swallow up the blog with spiders and spooky and all things black, I need to finish up my harvest decor for fall. 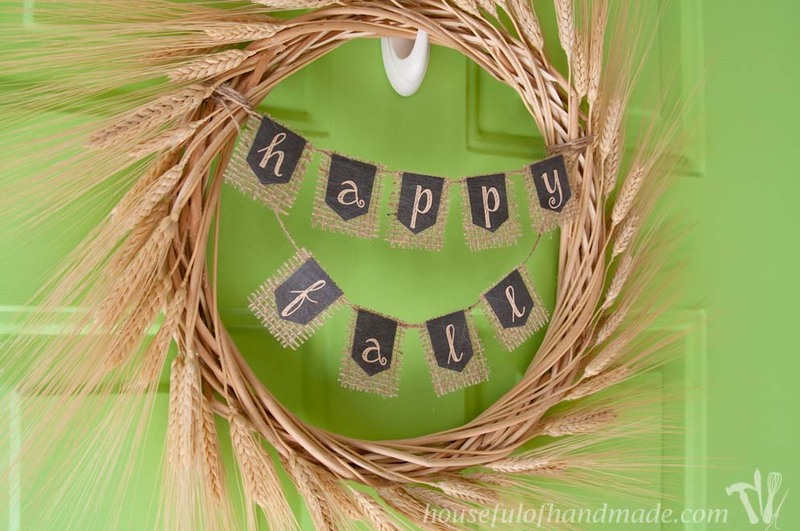 And my door was the last thing to get some fall with this beautiful wheat wreath. I loved the idea of continuing the theme of the harvest and farmer’s market when it was time to make a wreath for my front door. I was thrifting last week with my sweet little helper and lucked into an unused, natural-colored, twisted wreath form. It is a 13″ form, which I know cause it still had the tag on it from the store it was originally bought from. I usually never buy wreath forms and try using creative solutions for the base of my wreaths because I hate spending money (and some can be so expensive) on something that will be mostly covered up, but at the thrift store, it was $0.75. Perfect! As soon as I found the form, I knew exactly what I wanted to do with it. 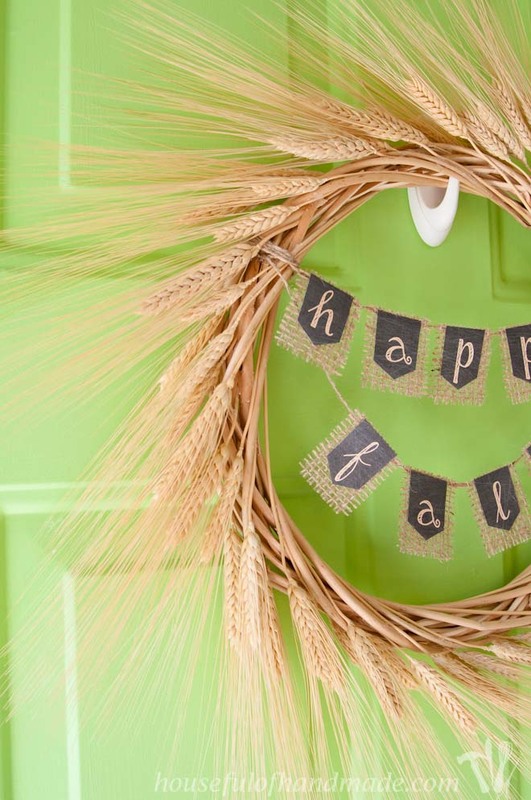 The colors of the wreath were perfect for pairing with wheat and the wheat fit the theme of my fall decor. So I grabbed one package of wheat at Hobby Lobby ($3.60 with a coupon) and headed home to create! I love how easy this wreath was to complete. It wasn’t super fast because I really took my time to carefully place each stalk of wheat, but I watched a show on Netflix and just enjoyed the process. This post contains some affiliate links for your convenience. Click here to read my full disclosure policy. 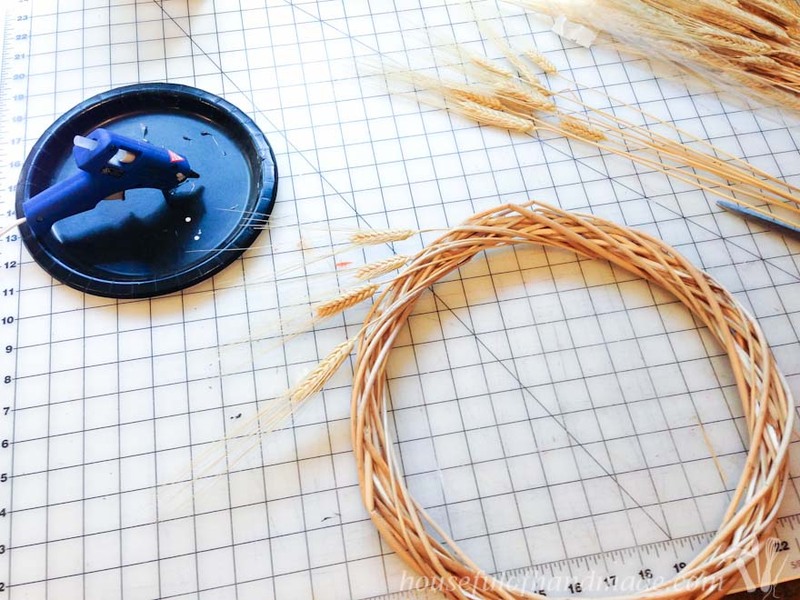 Start glueing the stocks of wheat around the perimeter of the wreath form. 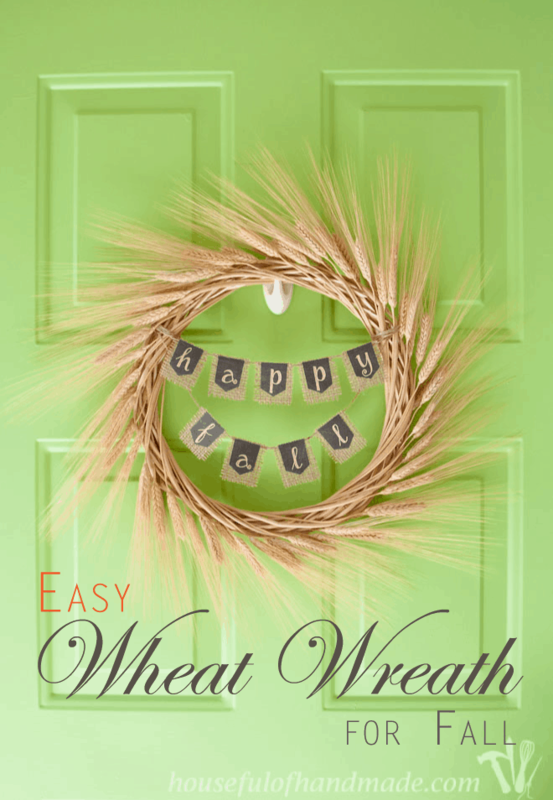 Wrap the long stems of the wheat in with the direction of the wreath twists. Then secure it with some carefully placed hot glue so it doesn’t show on the front of the wreath. 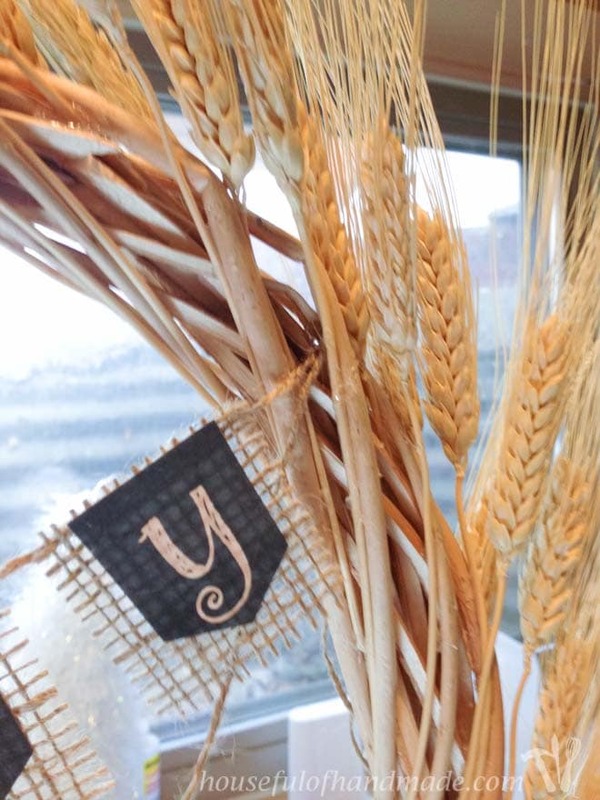 Make sure to wrap the stems of the wheat around to the back and secured it very well on the back with hot glue. After you have a single row of wheat stalks twisted into the wreath, evenly spaced around the whole wreath, it is time to fill in. 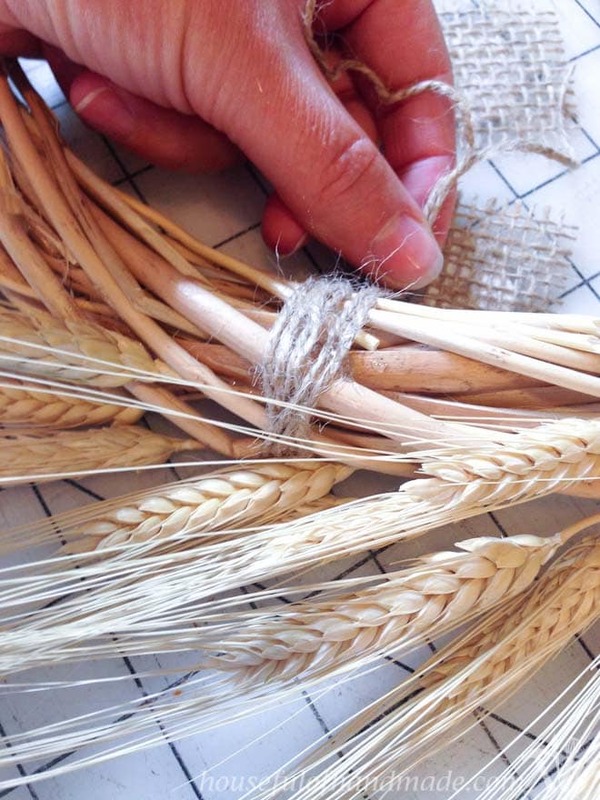 Cut the stems of the wheat much shorted and stick them behind the row that you twisted into the wreath form. Again, secure with lots of hot glue. 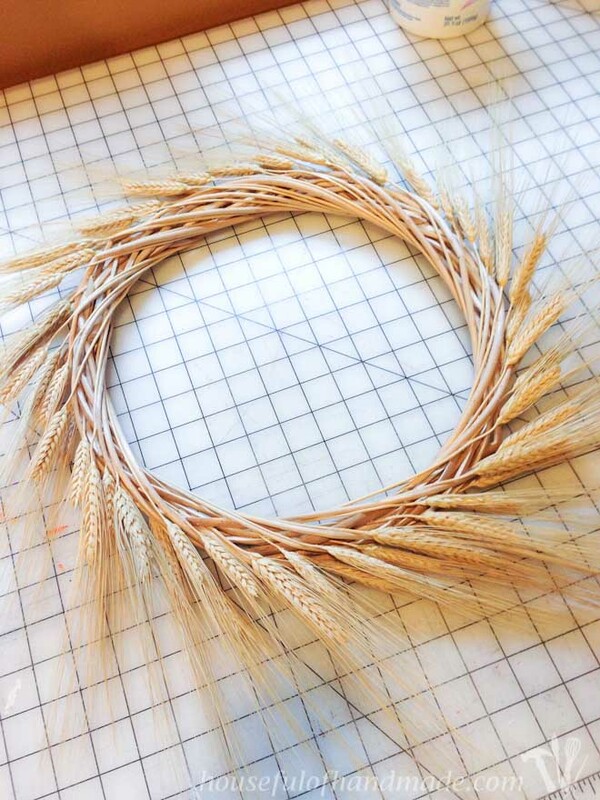 Continue adding stalks of wheat until your are happy with the fullness of the wreath. At this point, you can hang it on your door and be done, which I did for a few days, but I just felt like it needed something more. So I decided to add a simple, rustic bunting. Everything is better with a bunting, right? 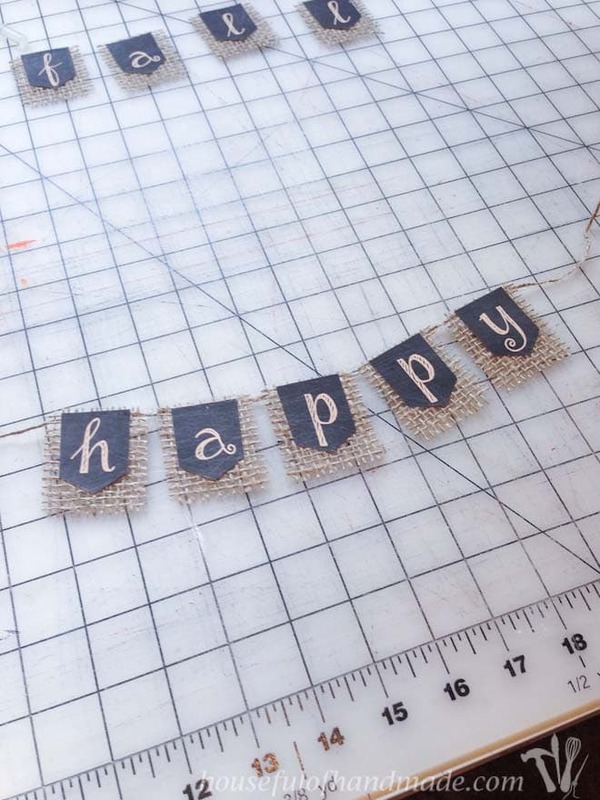 To make the simple bunting, download the printable file that I have included in my library of free downloads & printables for my email subscribers (click here to subscribe) or design your own. Print the pennants on 24lb thicker (but not quite cardstock) paper. 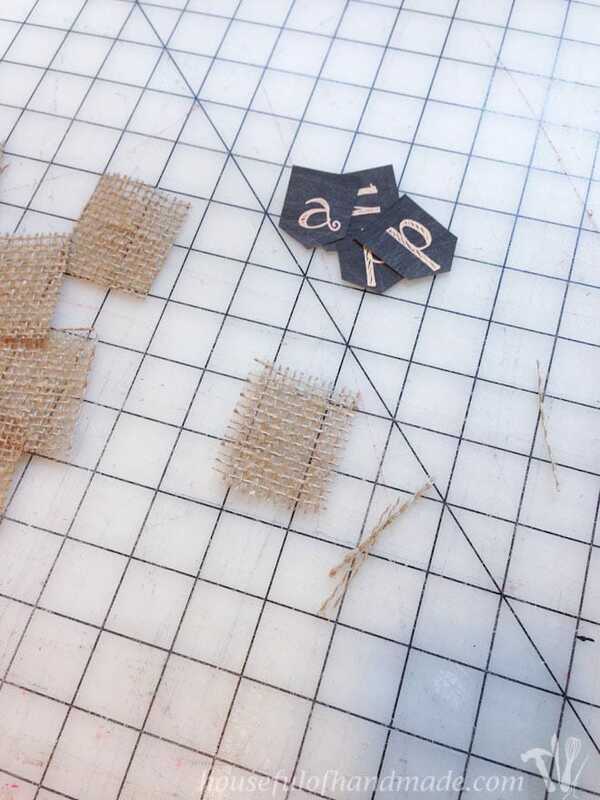 Cut them out, along with some little squares of burlap. I made my pennants 1 1/4 inches wide by 1 1/2 inches tall and I cut the burlap squares 1 3/4 inches wide by 2 inches tall. And I pulled the outer string of each side of the burlap square out so that it gave a little fraying to the edges. 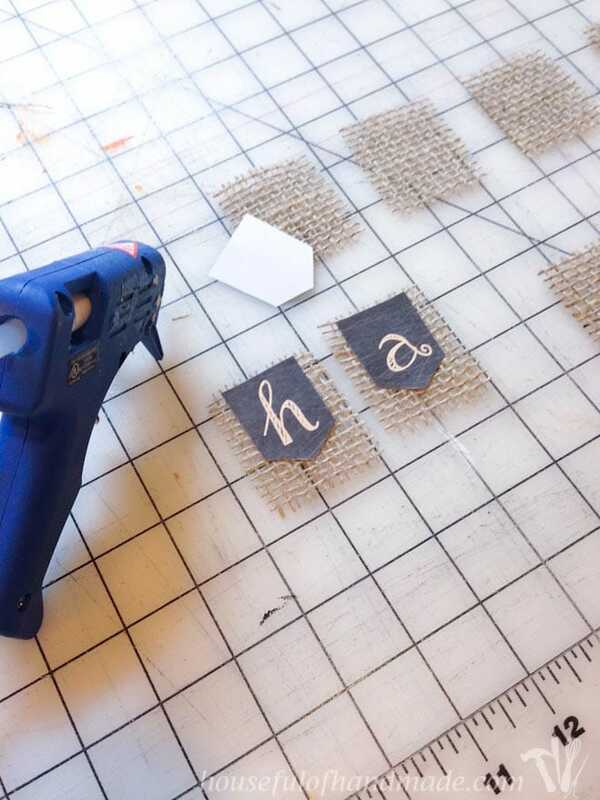 Glue the paper pennant to the top of the burlap square with some hot glue. I didn’t center it completely, I put it close to the top of the burlap. After all the pennants are glued to the burlap, it is time to glue them to the jute string. I found it was easiest to glue it upside down, and I used some pattern weights to hold the string out tight. But then I learned that you need to glue the pieces down backwards since they are upside down. Whoops! 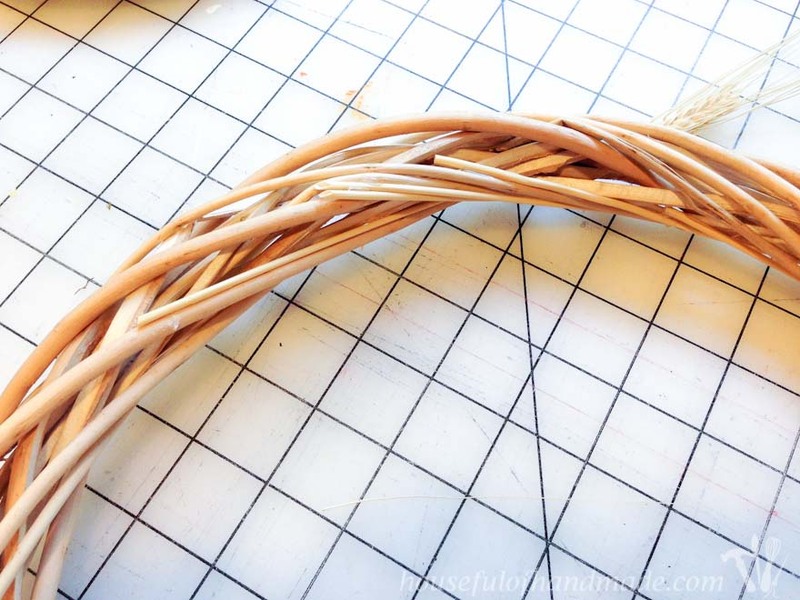 To attach the bunting to the wreath, thread the string through the twisted wreath form at the spot you want it and secur it with… you guessed it… hot glue! When you have both buntings secured how you like them, wrap the ends of the strings around the wreath form and glued them to the back. Trim off the excess strings. Now it is all done! I am so glad I added the bunting for a little extra oomph. 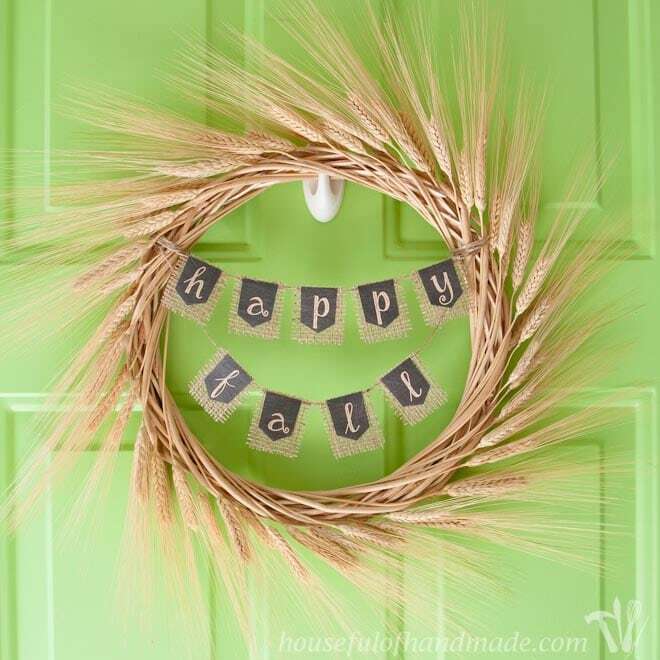 But it is still a simple and elegant wheat wreath for fall. I got it up on the door and I love it! As I was taking pictures, my adorable little helper says, “Look mom, I’m by the wreath. Take a picture of me!” How could I not? I may have to add a little paint to my Command hook so it blends in better with my new green door. Do you have any brilliant ideas for hanging a wreath without it being so obvious? I still haven’t figured that one out! Make sure to subscribe to my weekly newsletter so you can download your chalkboard bunting file and so much more! So I am officially ready… bring on fall! I love this! It’s absolutely perfect for fall! Thank you Angeline. I’m glad you like the tutorial, sometimes I feel like I take too many pictures and things get really long! This is perfect for fall. I love it!!! You did a great job and it seems so simple and inexpensive too. Thanks for sharing at The Creative Corner this week. I can’t wait to see what you come up with next week too. Love this wreath. So simple but perfect! 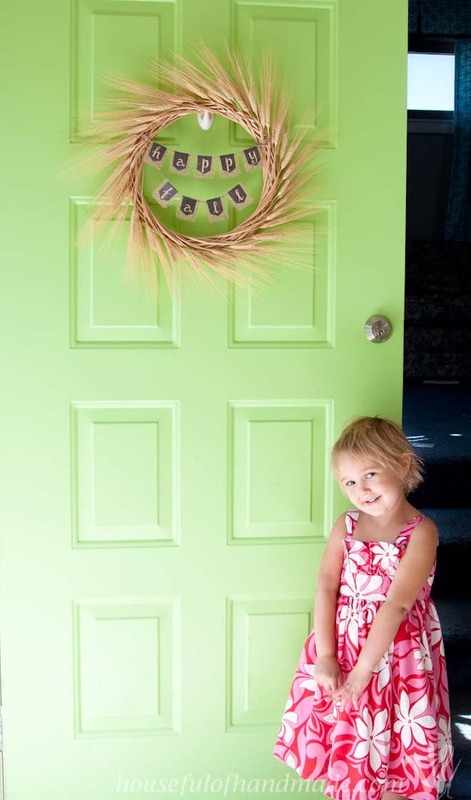 I love this wreath – I’m pinning this for sure! I don’t’ know if I have the patience, but I’ll definitely give it a try. I especially love the banner you made. It really doesn’t take too long, just about an hour of placing wheat stalks. I did it in two sections cause my kids rarely let me do anything for an hour! It’s so pretty! 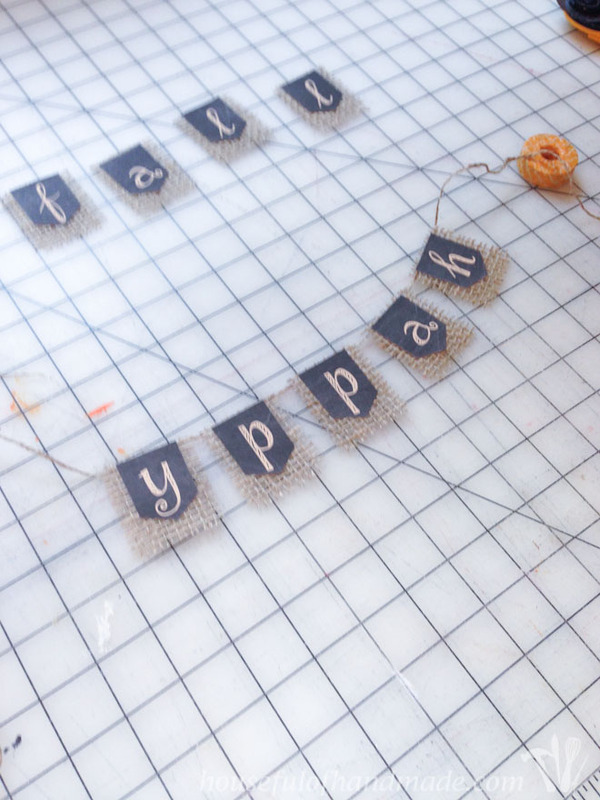 I think I’m terrible at crafts because I am so impatient. Maybe if I watched a show while I crafted I would get better at it? It’s a good suggestion anyway! If it wasn’t for Netflix on my iPad I would be more impatient with some mindless tasks that make the best crafts. Or audio books, I listen to about 4 audiobooks a month (great to listen to while cleaning too)! This is just perfect – I absolutely love it ! 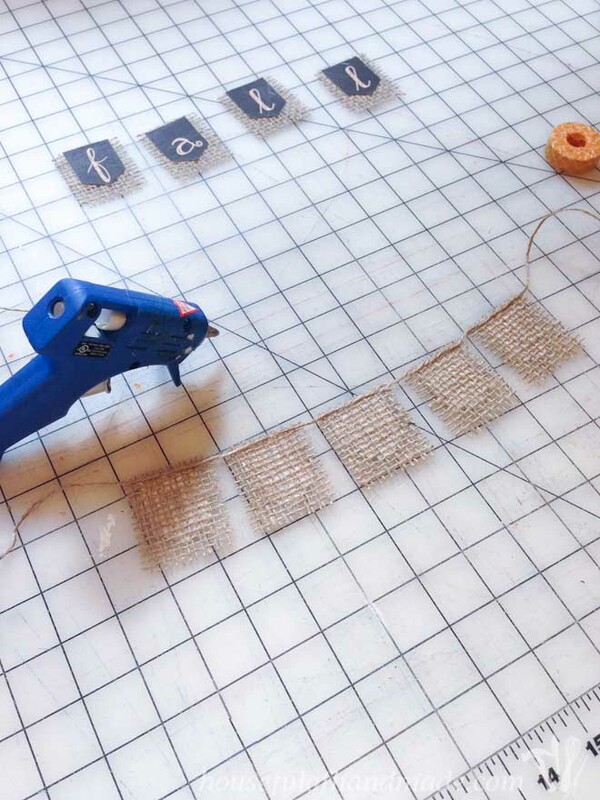 Pinning – and thanks for sharing ! 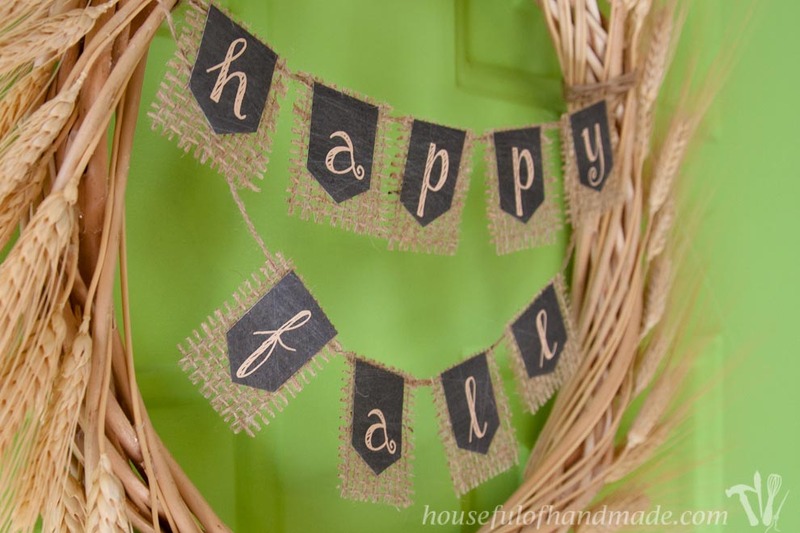 I love this~ So sweet & simple for fall! Thank you so much for linking up to Merry Monday this week! I am sharing your post today on my G+ We hope to see you next week for another great party! Have a great week! This looks great for fall! Thanks for sharing it at Totally Terrific Tuesday Link Party this week! Thanks Christie! It is perfect for fall. I had to ask someone where it was. It was hidden in the floral department in a dark aisle. Hope you can find it! This is sooo cute! I just bought a house and am so excited about making wreaths for every season and holiday. This easy idea is one I could pull off even with my crazy schedule this Fall. I love this DIY! I want to go make one right now! 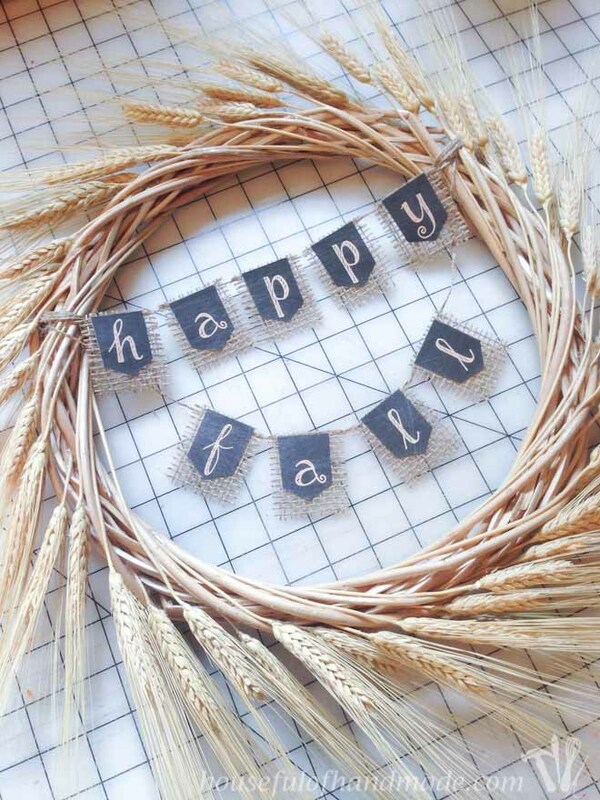 I just love wheat and it’s perfect for fall decor. Thanks for sharing! Just stumbled upon this wonderful project again today (still in love with it!) over that #HomeMattersParty, so bonus for you… you get two comments from me today! Hope to see you again next week at the #HomeMattersParty! I love how simple and elegant the wreath looks. Thank you for sharing the tutorial. I am saving it to Pinterest. Love this! Found it over at Friday Favorites link party. I think I have all of those supplies on hand, I may have to give this a try. Thanks for sharing. Thanks Chelsea! It was way fun to put together, hope you give it a try!